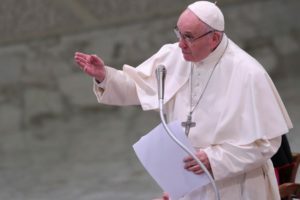 ROME – Pope Francis has today February 14 called for advances in innovation and entrepreneurship to transform rural communities and eradicate malnutrition, stating that “science with conscience” was needed to help the world’s poor and hungry. The pontiff made the call at the inaugural ceremony of the 42nd IFAD Governing Council which is being held at the UN Food and Agriculture Organization (FAO) headquarters today and tomorrow, Friday February 15. The world must “place technology truly at the service of the poor,” he said. “New technologies must not go against local cultures and traditional knowledge, but should be complementary and act in synergy with them”. He also encouraged greater global collaboration in the fight against hunger. “Today more than ever we have to join forces, achieve consensus, to strengthen our bonds. The current challenges are so intricate and complex that we cannot continue confronting them occasionally, with emergency resolutions,” he said. Pope Francis also encouraged those affected by poverty and hunger to be directly involved in decision-making “so that these people can be responsible architects of their own production and progress”. “We have to see to it that every person in every community is in the position to tap into their potential fully in order to live a human life worthy of that name,” he added. “(His) presence always moves us, inspires us and strengthens us in the struggle for a more just and more supportive world,” FAO Director-General Jose Graziano da Silva, said in his remarks during the inaugural ceremony. “The encyclical “Laudato si” teaches us the importance of having a balance between human beings and nature to guarantee the sustainable future of our planet. The fight against the impacts of climate change, against the causes of forced migration, and for healthy nutrition are today at the heart of FAO,” he said. The Prime Minister of Italy Giuseppe Conte and the President of the Dominican Republic Danilo Medina Sanchez also attended the event, along with other dignitaries. Conte thanked “all those working in the field, often in difficult situations, from the Rome-based agencies” meaning the three UN agencies hosted in Rome: FAO, IFAD and the World Food Programme. He said Italy is “proud to host the RBAs, now a clear hub for food security and sustainable agriculture in the world”.